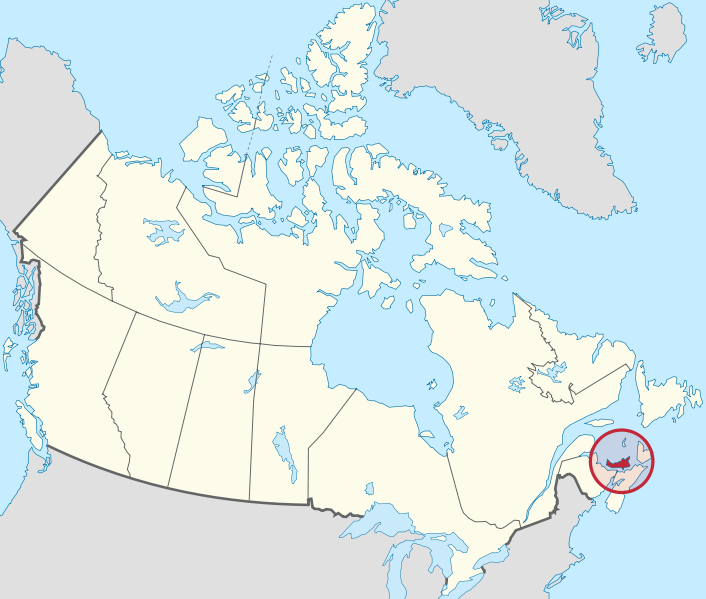 Like Rhode Island in the United States, Prince Edward Island is tiny! However, it is larger than Rhode Island. But while Rhode Island has a population of more than 1 million people, Canada's Prince Edward Island only has 146,000. Prince Edward Island (or PEI as it's often called) is located just above the border between New Brunswick and Nova Scotia. We've been to PEI a few times. My earliest memory was as a 14 year old on a two week cycling tour of PEI, Cape Breton Island, and the Magdalen Islands (part of the province of Quebec). And then in 1993, we took our kids on a two week vacation and rented a cottage on Prince Edward Island for a week. 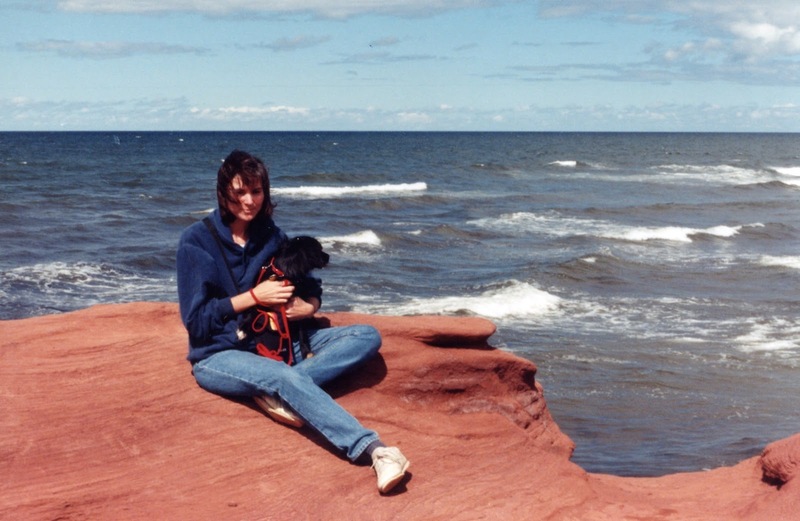 Ruth, with our dog Whiskey in Prince Edward Island... 20 years ago in August 1997! Prince Edward Island is well known for two things... the red soil, and potatoes! The red soil is caused by high iron oxide content. It's throughout the island, and includes the red sand beaches. And potatoes? The island is Canada's number one grower of potatoes. In fact, tiny PEI farms 88,000 acres of potatoes. The red soil with it's high iron oxide content make for near perfect conditions for potato growing. The next time we were in Prince Edward Island was the summer of 2008. Our daughter was training as a chef and was working for the summer at the premium Dalvay by the Sea hotel. So we decided to find a long term campsite where we could spend some time with her during her time there. Sherman, with his "add-a-room" attached. Cavendish Beach, Prince Edward Island. PEI is definitely a nice place to visit if you've never been before. And some people love it and go back time and time again. But we've been a couple of times and don't have much ambition to return. We like more mountains and varied scenery. But if you like being near the water, you're never far from that anywhere on the island! You forgot to mention Anne of Green Gables! Yes, he did and about the amazing feat it took to construct the Confederation Bridge from New Brunswick to Prince Edward Island. When I think of Prince Edward Island I think of Anne of Green Gables! One of my favorites. We used to love KOA's as kids. My dad was a surveyor and worked for a major railroad in land management, as well as the Forest Service while I was growing up, and we did a lot of off road (boondocking) camping in wilderness areas. He generally wouldn't go near a KOA, but we got to stay in them a few times & I thought they were a treat and loved them. When they put in their Kamping Kabins when my kids were growing up we were so happy. We have had some fun vacations using KOA's as our place to stay over the years. KOA's are great campgrounds when you have children because they are very family oriented. Not a campground that we would choose to stay at if we had to pay but we enjoyed our time there all the same. We love PEI so much we bought a 150 yr old farm house there and rebuilt it over 11 yrs..We've since moved on but return often to meet with neighbors and friends. That must have been a labour of love. I bet you must miss it at times! We love PEI too, I have been there 8 times firts time in !968 and last time 1997 always love that area and hope to get back that way again someday in the near future, exploring places we have not seen. Wonderful scenery and the people awesome. Glad that you enjoyed your time there. For us, Nova Scotia would be second to Newfoundland. On one of my road trips to PEI back in August of 79, it was a great adventure. When I travel I don't like to make reservations, as I don't know where I will end up at the end of the day. You always need to stop and enjoy the scenery along the way. On this trip it was before the bridge was built to the Island. We crossed on the ferry around noon and toured the island looking for a motel/hotel to spend the night. (not like today where I have the RV to overnight in). Just before 5 being in Charlottetown, and in a bit of a panic, decided to check with the tourist bureau to see where all the accommodations are. Said to the girl it is a very nice Island but where do people stay when they come? She looked at me sort of strange and said, normally people book places in February for the summer. She ended up finding me a second billeting person where we stayed in a nice ladies house where she gave up her bedroom, and she slept on her couch. Nothing like really getting to know the locals in places. Wow very interesting post. I do have to visit the eastern provinces of Canada! Yes, you definitely need to get out and explore our eastern provinces, they are beautiful! Yes, we have been to the Gaspe region and enjoyed it there. Have to say thought that we enjoyed the northern part of the Gaspe to the southern route from Campbellton, NB to Perce, Quebec. We found the southern route to built up for our liking and you didn't get to see much of the coastline along that route, although there were some pretty spots if you stopped and got out and walked around some of the small towns, we did find in that section that one town just blended into the next small town. The northern route was gorgeous though! We enjoyed biking on PEI's Confederation Trail -- we've done segments. Don't bother going after October (I think it was October) because much of the tourism part of the island shuts down, as in campgrounds. Really fun place to play, though. Yep, Prince Edward Island is a great place for bike riding. I remember riding ours a lot. There wasn't much open even in the middle of June. I think most of the tourism there is July, August and the beginning of September.